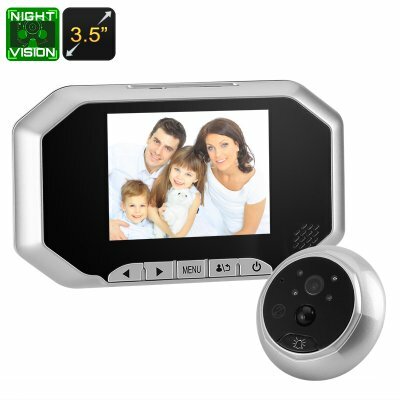 Successfully Added Danmini 720P Video Doorbell - 1/4 Inch CMOS, PIR, 160 Degree Lens, Night Vision, 3.5 Inch Display to your Shopping Cart. The Danmini Digital Peephole Viewer is the future for screening visitors to your home. This smart security door bell will fit almost any door and offers security screening of would-be guests. This video door bell fits directly onto the door with the 1/4 inch CMOS camera mounted where a door viewer or peephole would normally go. Then mount the display on the inside of the door and you have stylish entry system to monitor you visitors. Offering the best in entrance way security this video door bell system has a PIR motion sensor that will be alerted if anyone is lurking outside our door. The 720P camera will can then snap pictures or record your guest so even if you're out you will have a record of callers to your home upon your return. With a built in door bell guests can alert you of their presence and you'll have a clear view of them on the 3.5 inch LCD screen. the wide angle 160 degree camera ensures there will be no escaping the cameras view so you'll always know who your opening the door to. The do not disturb function means you'll not be pestered by door to door sales men and can relive yourself of the hassles of unwanted guests without having to fain politeness. while the not at home function will keep a log of all who visit while your out so you can see if you missed an important caller. The peephole doorbell has 4 IR LEDs that automatically activate in low light. This brings up to 5 meters of night vision to the camera so you can screen visitors night and day. This smart video door bell comes with 12 months warranty, brought to you by the leader in electronic devices as well as wholesale security gadgets and surveillance systems..